U.N. human rights officials have said Myanmar’s security forces may be guilty of genocide against the Rohingya Muslim minority. Since August, more than 600,000 Rohingya have fled to neighbouring Bangladesh since Myanmar began systematically targeting Rohingya armed groups. The Reuters report drew on interviews with Buddhists who confessed to torching Rohingya homes, burying bodies, and killing Muslims in what they said was a frenzy of violence triggered when Rohingya insurgents attacked security posts last August. The account marked the first time soldiers and paramilitary police have been implicated by testimony from security personnel in arson and killings in the north of Rakhine state that the United Nations has said may amount to genocide. Pope Francis has called for prayers for the Rohingya, the Muslim minority group forced to flee violence and persecution in Myanmar. Pwint Phyu Latt is a Muslim peace activist in Burma who sought to promote interfaith relations with Buddhists, the nation’s religious majority. She was sentenced this year to two years in prison and two more years of hard labor. Gulmira Imin is a Uighur Muslim in China who led the 2009 Uighur protests against its communist government. She has been in prison ever since. Revelations abound when refugees study the Bible's last book. Aung San Suu Kyi was awarded the Noble Peace Prize in 1991 for her work for democracy and human rights in Burma. But at the time of her award, she was under house arrest by Burma’s military; her husband and sons traveled to Norway to accept the prize on her behalf. Now, 21 years later, she is able to travel freely and finally, give the acceptance speech for her award. Broadcaster Tavis Smiley and Princeton professor Cornel West just wrapped up their 18-city "Poverty Tour." The aim of their trip, which traversed through Wisconsin, Detroit, Washington, D.C., and the Deep South was to "highlight the plight of the poor people of all races, colors, and creeds so they will not be forgotten, ignored, or rendered invisible." Although the trip has been met with a fair amount of criticism, the issue of poverty's invisibility in American media and politics is unmistakable. The community organizations working tirelessly to help America's poor deserve a great deal more attention than what is being given. The main attack against the "Poverty Tour" is Smiley and West's criticism of Obama's weak efforts to tackle poverty. For me though, what I would have liked to see more is the collection of stories and experiences from the people West and Smiley met along their trip. The act of collective storytelling in and of itself can be an act of resistance. One goal of just peace theory is to make war obsolete. The idea is to establish justice, in all of its various iterations, so that peace will prevail. Oh no, my eleven-year-old went to his first rock concert this week! Oh good, it was Bono and U2. That would express the feelings of many parents about their child's introductory rock and roll concert experience. Going beyond the blind spots. I spent my Monday lunch hour, and maybe longer due to D.C. traffic, standing with some 30 protesters across the street from the Burmese embassy, waving signs and shouting at curtained windows. 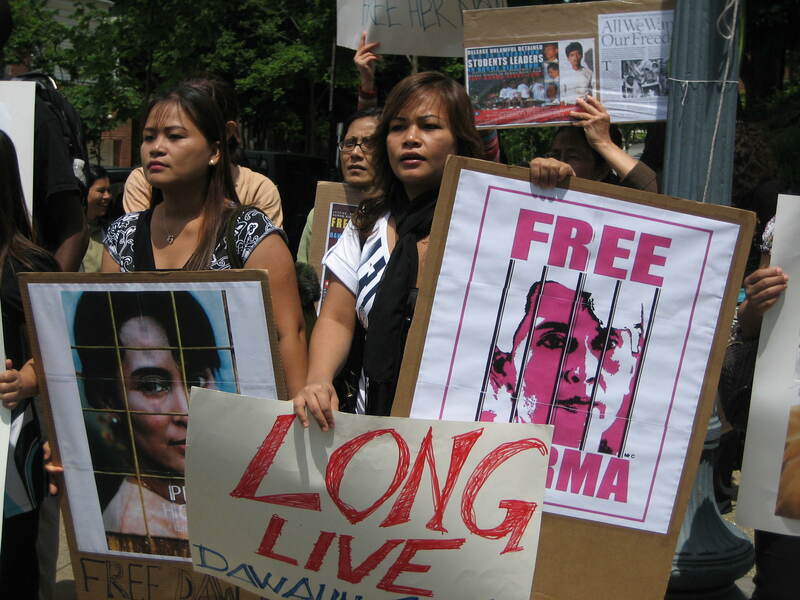 Hundreds of other demonstrators around the world were also protesting on behalf of Aung San Suu Kyi. Soldiers entering villages and killing people on sight. Landmines blowing pregnant women to smithereens. There's no way this is really going on. The world would never tolerate this. Don't forget the situation in Burma. Burma's resistance is not over.